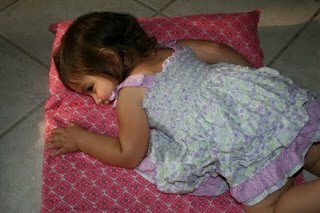 Check Out This Easy DIY Nap Mat Tutorial! This is the best easy diy nap mat tutorial! If I can do it, anybody can! Make these adorable nap mats for your kids. FYI, I originally made these nap mats back in 2010 and they are still going strong in 2018! My kids obviously don’t use their DIY nap mats as much nowadays, but we do find uses for them. My children attend a Mother’s Day Out program (that I also work at!) two days a week during the school year. 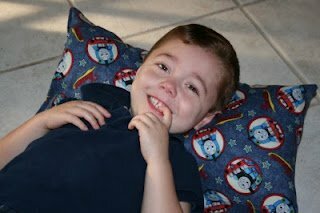 Since Noah is almost 3 1/2, he has been sleeping on a nap mat at school since last year*. Lizzie on the other hand is only 18 months, so imagine my surprise when they said she would be sleeping on a nap mat as well! While I wish her teachers all the luck in the world with that (seriously, I do. I taught this age group last year and was lucky enough to have them in cribs), I figured I might do something to help them out. Related: Did You Know I Taught Myself How To Sew? I loosely based the design on the tutorial here. My kids are super attached to their blankies, so I didn’t attach a minky blanket. I also decided I didn’t like the order of the steps from pretty early on, which lead to me changing something else and something else…. That’s pretty much how I roll though when it comes to tutorials. These 2 nap mats cost me what one would have cost if I had paid someone to do it for me. The embroidery on these alone would have probably added another $8 to each mat. Sometimes it’s worth the time and the effort to do it yourself. Not only does it save you money…look at how HAPPY those kids are! And over something I made them. Priceless! 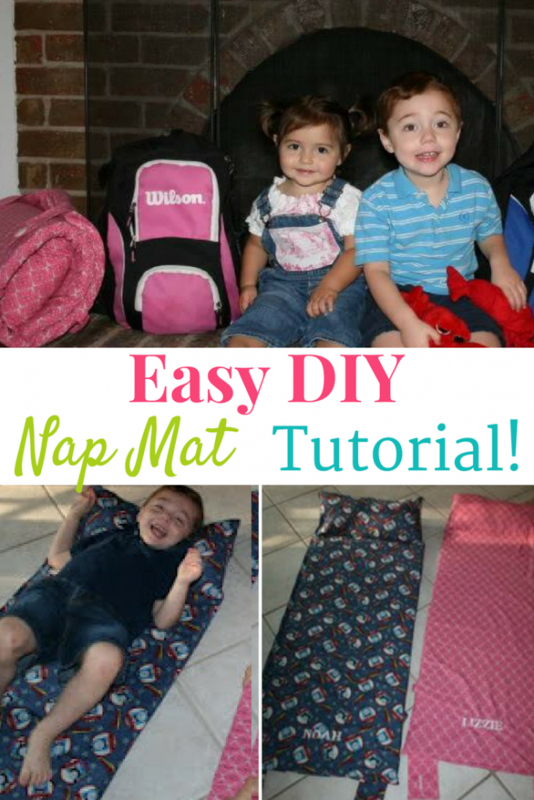 Be sure to check out this awesome nap mat tutorial! Update 2018 – My kids still have these nap mats. They are now 9 and 11, but we still find a reason to pull them out every once in awhile. They are still holding up just fine! FYI, I have some other sewing tutorials housed right here on Family Friendly Frugality! Check them out! *I shouldn’t say Noah “slept” on his nap mat. To my knowledge he did not nap ONCE last year at school. They did say he stayed quiet though…. They look so happy on their nap mats! You did a great job! Thanks Katie!!! 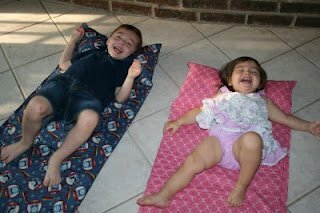 They keep saying "okay let's go nap on our nap mats!" Your children are adorable! 🙂 The nap mats are super cute! LOL, well they are 9 and 11 now and definitely have outgrown them. They worked for as long as they needed them thankfully! And they are actually still in great shape!